I’ve heard it said before that “environment trumps will”. For those of us who like to credit our success to our own grit, determination and hard work this is not an easy truth to accept. Sure, some of the greatest people have emerged from some pretty bad environments, but those are the exceptions – not the rule. How can we, as adult jiu jitsu practitioners, use this information to help us get better at jiu jitsu? Well, the good news is that we do have some control over our environment. It’s something that we can improve. Let’s look at a couple of ways our environment off the mat may be hindering our progress and maybe one or two ways our environment at the gym may not be helping us. Then let’s look at how we can turn that around. If you have a spouse and kids and you cannot get them on board, your home environment will not be ideal for progress and success. It’s a lot to juggle, but somehow you must get them behind you. Getting them involved is a great way to do this. Keeping things “fair” is important—if you’re spending 4-6 hours a week doing something you’re passionate about try to help your family members find things they are passionate about and make sure they have the time to pursue those passions the same as you are pursuing jiu jitsu. Another way to get them behind you is to ensure that they are also reaping the benefits of your journey—jiu jitsu should be helping you become healthier, happier, more confident, and more relaxed. In other words, it should be helping you become a better spouse and parent. 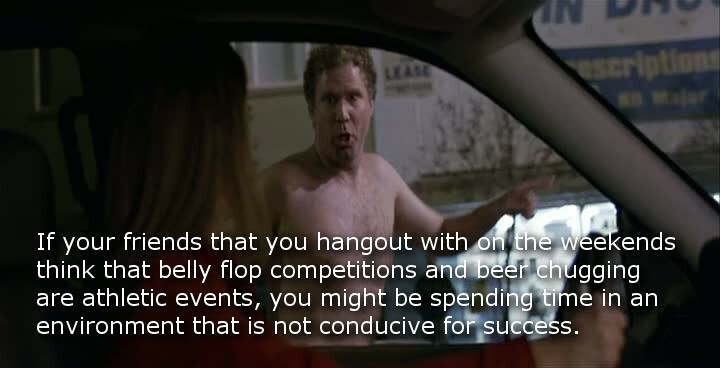 If your friends that you hangout with on the weekends think that belly flop competitions and beer chugging are athletic events, you might be spending time in an environment that is not conducive for success. You probably don’t need to completely abandon recreational activities that include bratwurst, beer, and belly flops…but you probably need to minimize them. The key here is, like they say, balance and moderation. What’s the environment like at the gym? How can you affect that? Is there an “I have to win at all costs” environment at your school? Here’s the problem with that: When you adopt that mentality, you find a way to win i.e. get really good at a few moves that seem to be really well suited to you and then only do those moves. Or you may only train with training partners with less skill or lesser attributes which obviously won’t challenge you to the same degree as training with partners who are better than you. If this attitude is prevalent at your school, here’s how you can make a difference. First of all, roll with everyone and tap when you’re caught without trying to spaz out of the submission and don’t make excuses. Secondly, when rolling with training partners you can easily beat, roll in such a way that puts you in bad positions or get’s you caught once in a while, i.e. start from bad positions, work from your week side, try new techniques, etc. For more ideas along these lines check out Six BJJ Training Games, by Byron Jabara. By approaching jiu jitsu this way you will be setting an example that others will eventually follow. Is there a “me first” mentality where students seem to only be concerned about their own progression? While this seems to be a mindset that would indeed help you get better faster it is, in the jiu jitsu world, actually counterproductive. There should be a culture of comradery with the mind-set that a rising tide raises all boats. If you are training at a gym where other students, as well as the instructor, are concerned about your progress and are willing to invest in your success then you are training in an environment where you are likely to succeed. The solution here is simple, but not necessarily easy: Model the behavior you hope to see in the rest of your team. Take a round or two every class for a while and make it about your teammate. I’ll often time ask my teammates what they’re working on and then steer the match in that direction. In conclusion: I’m not a life coach, marriage counselor, nutritionist, or even a jiu jitsu expert so I can’t necessarily tell you the best way to improve your environment. But I can tell you that there’s enough evidence out there to indicate that it would greatly improve your chances of success if this was something you paid some attention to. Maybe pick one area of your life and work each week to make that area just a little better.